Kitchen remodeling in Claremont CA can be a big investment. It’s important to trust your investment to a true professional like Cabinet Magic. As a licensed contractor, we can take you through every phase of the project with ease, from the initial design planning to sourcing the best designer materials–including custom cabinetry–to installing and finishing everything to a high standard. 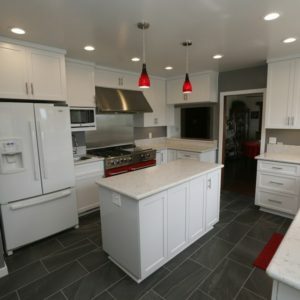 Whenever you do kitchen remodeling in Claremont CA, you run into the challenge of making design decisions based off of product samples rather than the real thing. This can be problematic. For example, maybe your backsplash tile will suddenly look too busy when it covers a whole wall, or perhaps the new placement of your fridge will turn out less convenient than you’d hoped. At Cabinet Magic, we believe being able to accurately visualize your kitchen remodeling in Claremont CA before work begins is key to being satisfied with the final result. That’s why we offer 3D computer rendering services on every remodeling project. This way you can see every detail and approve it before we begin work. If you are interested in working with Cabinet Magic for your kitchen remodeling in Claremont CA, please give us a call at 800-828-4380 so we can set up a free in home consultation with one of our knowledgeable team members. We’ll go over your wish list with you and provide an estimate for the necessary remodeling work.